And so it begins. 36 become 12. GOODBYE ALMOST ALL OF YOU. The primary focus of the live blog will be the borderline teams, the actual fights for regionals qualification, with an emphasis on bars and beam because that’s usually the place where things go wrong and I’m a glutton for disaster. At least that’s the plan. Hopefully the broadcasts understand our needs. Gowey is slated to do AA in early lineups. She did not do FX at SECs. Jacey Baldovino (AA) of Yale is out. Replaced by Belle Huang of Rutgers. Here we go! Raleigh broadcast beginning. 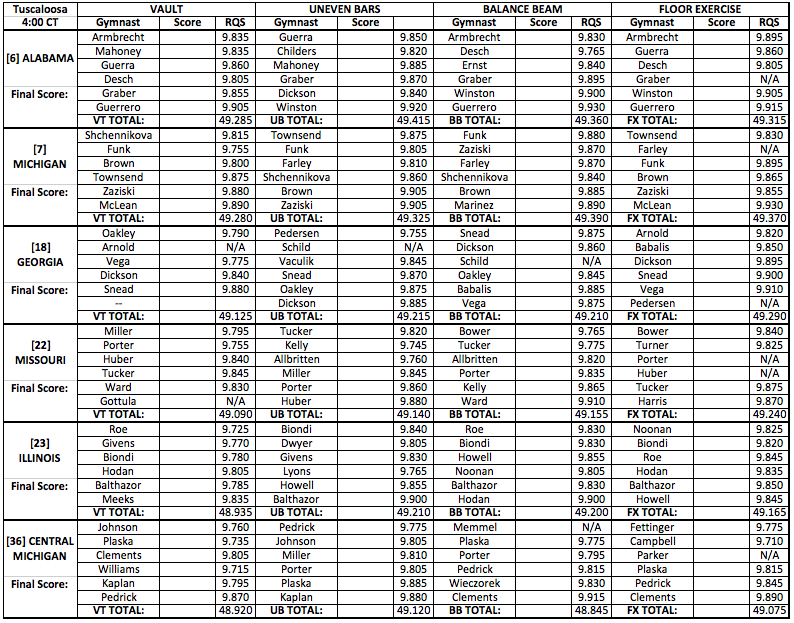 Critical opening rotation for Nebraska on beam. We’ll learn a lot. Host NC State starting on bars. Warmups still going in NC State. Feeds not yet started at Penn State. Feed now underway at Penn State. Still on intros there. Kirby – FX – LSU – rudi is solid. This floor is verrrrrrry white. Double tuck, secure landing – front lay to front full is short with two small steps back, will be the largest deduction in the set. 9.775. Wild 9.750 on UB for NC State. Burgess and Bixler for Maryland, some pretty large lunges back on big Yfulls. Stuck DLO for Tamburro on UB. Schweihofer – BB – Nebraska – bhs to lay-pike, secure – beat – a check on choreo, tentative mid-routine, switch and switch 1/2, nice shape – full turn is fine – 2/1, stuck. Three good hits in the first three for Nebraska. Priessman – FX – lunge forward out of middle pass, otherwise fine – double pike, a little short with a lunge. A struggle pass in each one so far. Fillard with a hop back on DLO for NC State. Fingertipped her release but got it. Houchin – BB – Nebraska – hits loso series – aerial, smallest check but fine – switch to split “Carrie Hochin” – side aerial, pretty – 2/1, hit. 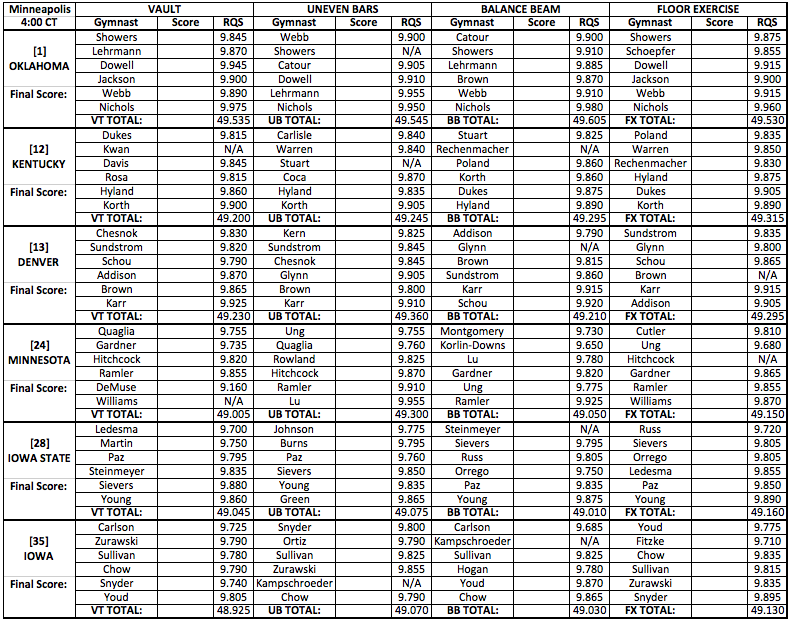 Nebraska absolutely did not lead the country in home attendance. Kent – NC State – UB – small hop in whippy DLO. Edney – FX – LSU – good adouble arabian, very solid – 1.5 to layout, a touch of arch at the end but great height – switch ring to split leap full, a little short – double tuck, also short and buckles on her last pass with a lunge forward. Kngith – NC State – UB – clean bail – pretty close hit on hs – good height on tkatchev, just foot form – DLO with hop back. Hit beam for Breen, so that’s five hits for Nebraska already. Huge deal. Finnegan – FX – LSU – 2.5, big lunge forward, just kept it in bounds – very strong double back – pretty leaps – double pike is great as well. Still one trouble pass, but it was the first one this time. We’re treated to McKellar’s huge piked jaeger and Pak, and double front. Hambrick – FX – LSU – usual DLO shape, stuck – 2.5 to front tuck, very secure – split leap full to wolf full, a little rushed on the split but good landing positions – double pike, large bounce back. 9.900. 49.350 for LSU, behind Nebraska’s 49.375. NC State and Maryland went sub 49, not good news for those two. Hundley – FX – Florida – whip to double tuck, bounce back – switch side to popa, good 180s, somewhat indistinct finish position – double pike, secure landing, not the most height – back 1.5 to front layout, some knees. OK routine but things to take. 9.825 a little high for me. 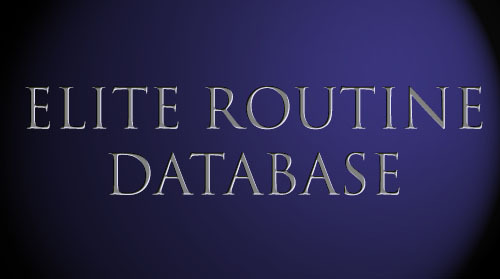 Rose – BB – Washington – aerial to bhs, mostly solid – y spin to switch to beat, love the switch, drops the leg a little early on the Y to get the connection, but nice individual elements – cat to side aerial with a small check – stuck dismount. 9.725 is tight. Maybe didn’t get the spin to switch combo. Gowey – FX – Florida – double pike, nice and secure – switch 1/2 to wolf full, well done – double tuck, a little bounce back – good power in combo pass, just some knees. 9.825. Schaefer – BB – Washington – aerial with a check – bhs loso, another small check – full turn, good – split to double stag, another check, little things adding up here – 1.5 dismount with crossover step. 9.700. Penn State working against a fall on bars in the second position. McMurtry – FX – Florida – 3/1, good this time, just the usual staggered legs on landing that makes it look under-rotated – front lay to front full, strong landing, good height – split leap full to wolf full is OK, not quite full extension – double tuck, secure, chest a little forward. 9.875. Copiak – BB – Washington – bhs loso, secure – switch 1/2 is a bit short – side aerial, hit – stuck 1.5, Pretty good. 9.775. Slocum – FX – Florida – whip through to double pike, mostly secure, just a little bounce of awkwardness on landing – split leap full to wolf full, good height – front full to front pike, very nice, legs together, avoiding the splay-footed landing she can have on other elements – rudi to double stag, good. Penn State now counting a fall on beam, which will take them out of the meet. Goings – BB – Washington – three series to loso, very crisp and precise – beat to straddle 1/4 hit – full turn, nice flourish – side aerialt o stuck full. Nice. 9.875 is a better reward for that routine. Edwards – LSU – falls on her 1.5 on vault, wayyyy short, no chance to save. Good hit for Boren on FX, just a little bouncy on final double tuck. 9.900 is a bit high for me for that bounce. Roberson – BB – Washington – switch to straddle 1/4, mostly fine, a little short – standing loso loso, secure – stuck gainer full. Harrold hits her vault critically for LSU for 9.800. Cannamela stuck full on vault for LSU. Burleson – BB – Washington – aerial to bhs series a little hesitant in connection – side aeiral to switch, good individual skill execution – split to straddle 1/4, very well done – side aerial to stuck full. 9.950 for Hambirck on 1.5. Edney sticks 1.5, just knees to take. Much better from last two to make up for the early lineup. Really nice stick from McLaughlin on bars for GW. They needed that in this 9.7-a-thon. Still goes 9.6s. Must have been issues at the beginning. Florida just OK on floor for 49.325, but will heavily lead. Washington goes 49.075 on beam, which would seem not great but UNH and PSU are out of it after one rotation and we’ll see how the other teams are evaluated on beam. Floor scores pretty high at this NC State meet. Davis goes 9.850, which I’m surprised by after that middle pass. Lowery – FX – Oregon State – double pike, well controlled – split leap full to popa, nearly there on 180s, good height and landing position – hit rudi – front lay to front full, a little flat but well controlled. Nice. 9.850. Same score as Davis? 48.625 for GW on bars. Their weak event, but needed to be closer to 49 with what the seeds are doing. Knight – BB – NC State – bhs loso, small check – nice big leaps. Really good – cat leap to side aerial, large leg-up wobble. That will be significant in the AA race – stuck gainer full. Advantage LSU and Nebraska after two in Raleigh. Nebraska 49.375, Oregon State 49.225. NC State and GW not getting the scores to be in this thing early. Time to add another two regionals to the mix people! Baumann vaults for Florida this time. Not the best landing. Better from Foberg to follow. Rose’s beam routine got raised to 9.775 for Washington. More realistic score. 9.900 for Boren on her 1.5. Slocum follows – handspring pike 1/2, fantastic stick. One of her best ones. First two floors for ASU in the 9.7s. McMurtry – VT – Florida – just the FTY. Fab stick and gorgeous as we expect. Could go 9.950. They probably don’t need the extra difficulty today, but interesting choice nonetheless. 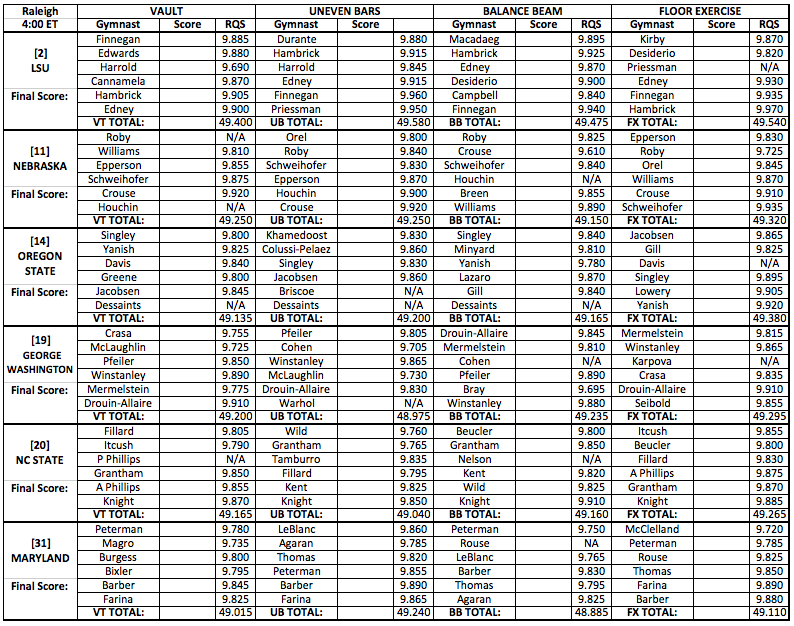 West Virginia counting some 9.7s on bars here. Judges discussion for ASU’s third routine on floro after a 9.775 and 9.700. LSU and Florida both through floor and vault well enough with 98.80-0 and 98.725 respectively. No worries for those two yet. It’s a 9.700 for Ginn that will have to count. K Szafranski – FX – ASU – double pike with pretty sifgnificant bounce back – double tuck, better – split leap full to popa – 1.5 to layout, really clean but took it right to the edge, saved it from OOB? Hit floor for Epperson first up for Nebraska. First 4 floors for ASU’s all 9.7s. Not challenging Washington yet. Mermelstein – BB – GW – bhs bhjs loso, well hit – beat jump to double stag, under control – full turn, held – switch to straddle 1/4, a little short of 180s – 1.5 with hop forward but very nice routine. Good confidence. Roby looked better in the floor leaps today, a couple small landing issues. Pfeiler – BB – George Washington – bhs loso with a check – switch to loso, solid – switch side, a little short but solid – hop back gainer full. Williams – FX – Nebraska – double pike with large bounce back – front lay to rudi, secure, crossed legs – short on leaps – bouncy on double tuck. 48.875 for ASU on FX. Advantage Washington. 49.100 for Oregon State on vault. About as expected but going to give up more ground to Nebraska. Funk – BB – Michigan – switch side 1/4 with a check this time, nice 180 – nice straddle o1/1, well completed – side aerial to stuck full, good start. Armbrecht on FX for Alabama – nice rudi to double stag to end – a little low on middle pass. Guerra controls her floor landings – finishes double pike, a little short. Givens – UB – Illinois – giant full to gienger, kind of close but caught – short final hs – giant full to double tuck, leans to hold the stick. Rechenmacher – Kentucky on beam now – nice switch split – gainer pike, stuck. Desch – FX – Alabama – big double pike (no double arabian), small slide – hits combination middle pass, a little short coming in but in combo so covered – very short leaps – double tuck, stuck with chest down. Brianna Borwn sticks 2/1 on beam. Nearrrrrly stuck DTY from pedrick, small step adjustment. Graber – FX – Alabama – nice control on full in landing, chest up, well doen – switch side – wolf jump 1.25 – front lay to front full – crazy legs on a rudi, otherwise good. Korth – BB – Kentucky – stick to back tuck with a check – some low early scores for Kentucky on beam – great stick on 2/1, that will help. Hit three series on beam from Farley with legs. Illinois 49.125 on bars which could be ahead of Michigan after one. Great landing from AJ Jackson on her open full in this time. 48.675 for Arizona State on vault as this thing continues looking like a Florida/Washington story. Webb for Oklahoma a little bouncy on floor but good. Still 9.950. OK.
48.900 for Kentucky on beam. Danger watch. Alabama 49.200, Illinois 49.125, Michigan 49.075. Alert. Kentucky beam adjusted to 49.025. That helps. Still a worry. 9.975 for Nichols on floor as Oklahoma goes 49.600. So one spot is set. Edney – UB – hits Hindorff – solid bail – small arch in final cast hs – DLO with a hop back. Not really getting the sticks on bars so far but otherwise solid and LSU has a big lead. 49.350 for Washington on floor as Florida and Washington open up a big lead. Nebraska 49.375 on vault. Would have to miss bars at this point to let Oregon State back in. Otherwise this will be an LSU and Nebraska story. What you need to know right now: Raleigh and University Park going smoothly for those teams. Nebraska and LSU are crusiing (the story being how close Nebraska is to LSU), as are Florida and Washington. Tuscaloosa is CLOOOOOSE and Kentucky didn’t get a great beam score in Minneapolis, opening the door for the other teams. Finnegan – UB – lSU – gorgeous on everything, stuck DLO. Mahoney – VT – Alabama – another larger bounce back on full. Stuck dismount from Kelly on bars. Graber – VT – Alabama – stuck her 1.5 with a just a little knees – that will help. Yeah that was a miss from Pedersen so Georgia will have to count the 9.700 from Arnold on floor. Four hits so far for Illinois on beam. Keeping this interesting for sure. Ramler – UB – Minnesota – toe Shap to Pak, great legs throughout – hit handstand – toe Shap 1/2, just some feet – full in, hop back. Good. Ivy Lu with hop forward on DLO on bars. Will have to count two 9.6s in this rotation. Addison – FX – Denver – DLO, excellent, chest up – 1.5 to layout with a little momentum-carrying step forward – switch side to popa, good extension. double pike, great. Should be a big score. Georgia now counting a 9.675 and 9.700 on floor. Denver will have the edge over Kentucky after one event here, as Denver wanted. Vega – FX – Georgia – controls double pike – back 1.5 to layout, OK, a little bouncy – strong double tuck. Saving the rotation as much as it could be saved at this point. Illinois keeps it going 98.325 after two events. Georgia 48.950 on floor. Missouri 49.075 on bars, which matches Michigan. 49.350 for Denver on floor. NC State finishes with 196.050, a very respectable score even though it won’t challenge the qualifying places. Intros underway at our final two competitions. Washington just 48.750 on vault, which has opened the door potentially a little. But probably not really. LSU will cruise through. Nebraska needs to hit bars to get the second spot, with a nearly 7-tenth lead ofver Oregon State. We have an early fall for Iowa on bars. Fall for Kentucky on floor. Warren. Marinez for Michigan, fall on floor. Eeeeenteresting. Surprised she was in the lineup. Kramer – FX – UCLA – front double full to front tuck, secure, same with 1.5 to layout, one of her good landing days – nice leaps – rudi to leap, hit set. Just 49.125 for Denver on vault. Letting Kentcuky back in with a couple more hit floors. Zaziski – FX – Michigan – double pike, lunge back but maybe controlled – nice split leap full to popa, gets them around and hits 180s – front lay to front full bouncy but high – karate kick because Paige – double tuck, a bit uncontrolled witha step back. OOB I believe. Fall from Garner second up for Arkansas on beam. Reinstadtler had one flat pass from Utah on floor, otherwise good. They’ll want to drop Lewis’s score of 9.725. Pitt getting big numbers on bars. Gallarzo – BB – Cal – aerial smooth to bhs loso, hit – switch to split, OK, nearly there – stuck 1.5. Ward – BB – Missouri – three series to loso, very secure – switch to pike jump – full turn is good – cat leap to side aerial, does well to hold and not check – 1.5, holds the stick. Nice set. Of course Nebraska would have an opening fall on bars, just to keep things interesting. Oregon State having its own struggles on beam. Annnnnd it’s a fall from Lazaro for Oregon State. Epperson a little leg break in the bail on bars but otherwise hit, leans to hold the stick on DLO. THey need two more hits. So Seilnacht – BB – Cal – nice full turn – bhs loso, smooth and clean – side aerial to full, off to the side but holds the stick. 49.400 for Kentucky on floor, closes the gap entirely with Denver! UCLA 49.375 on floor, not quite what they wanted but will do the job. Utah will have a big score on floor. No trouble early. Stanford counting a disaster on floor for 48.050, so out before it started. Price 9.900, which will keep her in good position in the AA but her score is usually higher. Cal 49.125 on beam is fine for now. We’ll see what Auburn and BYU do. Michigan with 48.850 on floor. Drops behind Georgia to be tied with CMU for fifth. WOW. Arkansas 49.175 on floor to stay ahead of Pitt. It’s a bars hit from Nebraska and a 9.975 from Houchin (I mean…it was good…) so Nebraska will go through with LSU with a 197.525. Townsend – VT – Michigan – sits down her 1.5. Continues being not Michigan’s day. Very surprising. Hop back for Zaziski on full, a little more piked than her usual to try to save the landing. McLean – VT – Michigan – full, big and open, leans a little to hold the stick. Will save the rotation a bit. Roe – FX- Illinois – Double pike, keeps plant foot down – short on some leaps – front lay to front full, a little low but she’s so tiny she can get away with it. Ross will a little hop back on her full, not her best vault, a little pike we don’t expect. Kentucky 49.225 on vault. Stepping way up from the lower opening beam score. Denver on a bye right now. 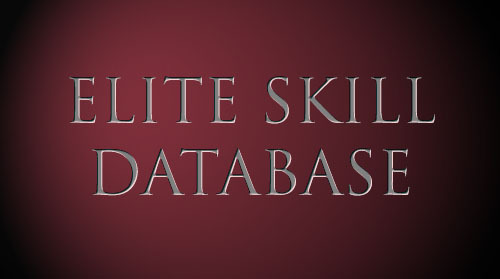 Winston – Ub – Alabama – Shap, good – nice hs – gorgeous Pak as always – DLO, step back this time. 49.050 for Michigan on vault, not helping so much. The hit bars for Washington mean that FLORIDA and WASHINGTON will advance to nationals. Howell – FX – finishes double back, forward with a lunge. BYU 49.075 on bars. Just behind Cal after one piece. Waiting on Auburn to finish. Oklahoma cruising through. Big bars rotation for Denver coming up. UCLA competed out of order on vault and has received a 0.1 neutral lineup applied to the whole team score. YOU GUYS. Shouldn’t matter, but GUYS. Pittsburgh counting mistakes on beam to fall out of it. Boise State counting a 9.600 on floor to go 48.850 and dig a pretty big hole for themselves as Ohio State and Arkansas are neck and neck for the other spot. Milliet – FX – Auburn – front lay to rudi, nice – double pike, a little short but pulled it out – 1.5 to lay, clean – Auburn will have the #2 spot after its first event. 49.325 for Auburn on floor. HUGE. Serious lead right now. It’s 49.050 for Illinois on floor. Maintaining a four-tenth lead over Michigan with one to go but this is not over because Michigan is very capable of doing more than four tenths better on the final event, on bars to Illinois on vault. CMU still right in this. Maybe a hair out. Actually Georgia is still in this too. No one nailing this meet. It’s very live for this second spot as Alabama pulls ahead. Looks like it was Ross and Tratz out of order for UCLA on vault? Biondi – VT – Illinois – Y1/2, great control on landing, some pike and knees in the air but a great landing. Vaculik – UB – Georgia – fab Gienger as always – some hs, little leg break in bail – full in, usual legs, small step. Pretty good. Meeks – VT – Illinois – good height on full, bounce back, some knees throughout, but they will break 49 on vault, which is a huge deal for them. Final for Illinois is 196.425. BIG. Michigan will need 49.450 on bars to tie Illinois. We’ll wait and see what Missouri and Georgia need. Alabama doing its job to hit beam. Stuck full in for Glynn from Denver on bars. Huber – FX – Missouri – front lay front full with crossover step out – 2.5 fianl pass, awakrd landing and has to put her hand down. Dickson fell on bars for Georgia but still 49.350 to put Georgia RIGHT THERE somehow after floor. Georgia needs just 49.100 on beam to tie Illinois. Alabama has a hit beam rotation before Guerrero goes and will be safe. Georgia needs 49.100 on beam to tie Illinois. Missouri needs 49.300 on vault. 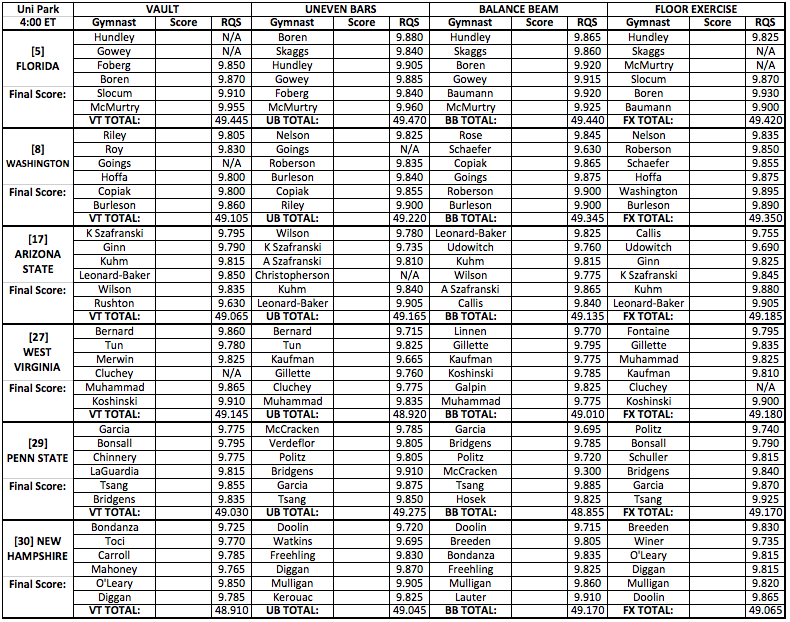 Michigan needs 49.450 on bars. Arkansas establishing a multi-tenth lead on Ohio State and Boise State at the halfway point. Regionals: When Maggie Nichols gets a 10 on beam but you weren’t even watching because Oklahoma was already safe. Williams – FX – Cal – finishes with secure double pike. That routine will put Cal back into 2nd at the halfway point. Cal has a .175 lead on Auburn and .250 lead on BYU after two events. Snead – BB – UGA – hits series – hitch kick to switch to back tuck, low chest on back tuck but holds it- stuck 2/1. Bounce back for Miller on vault. Another bounce for Harris. Hop back for Townsend on double tuck bars dismount. Funk – Ub – Michigan – giant full to tkatchev, usual, big and legs – overshoot – DLO, two small steps back. Not getting the landings. Kentucky getting the necessary early scores on bars compared to Denver on beam. Brown – UB – Michigan – nice first hs – Ray, strong – toe on to Pak – pretty good hs throughout – DLO with a lean to hold the stick. Did what she could. Working against a 9.4 is Denver. 49.375 for Michigan on bars, which will not be enough. Michigan has been eliminated. It’s a 197.050 final for Kentucky. They couldn’t have asked for a better meet. Denver is counting a 9.4 on beam now. It’s 9.675 for Balalis with those checks. Vega – BB – switch to straddle 1/4, hit – bhs loso, smooth and hit – full turn, good – aerial to beat jump – side aerial to layout with small slide. That’s more than 9.825 in my book. 9.875. Georgia advances by .075 over Illinois. Tough break for Illinois, they couldn’t have done better. Georgia did it on the day and got that mid 196 road score. Still VERY surprised that a 196.500 was able to advance here. Speaks to the struggles Michigan had. It’s a low beam score for Denver and Kentucky will advance along with Oklahoma. In the final two regionals, UCLA and Utah look like they’re cruising. Cal and Arkansas in the second spots for now but not comfortable yet. Arkansas a little more comfortable than Cal is with Auburna nd BYU right there going to the 5th rotation while Cal is on a bye. So it’s a 9.900 for Grace Glenn to lead off UCLA on beam as the Bruins continue rolling despite the vault debacle. 49.200 on bars from Boise State helps, but they’re going to need Arkansas to miss in the next rotation. That was Krippner with the tkatchev struggle for Auburn but still got away with 9.725. Already counting a 9.750 now though. 9.950 from Ross officially means UCLA will qualify and do so easily. Day with a hit on bars for Auburn, double arabian dismount, solid until the step back. Soloski is in on beam for Utah instead of Burch. Scores have been rising on floor all day so watch out for BYU getting a preposterous number. Cerio – UB – Auburn – clear hip 1/2 with a little arch – hits piked jaeger – bail, solid – giant full to double tuck, stuck. Good. Milliet – UB – Auburn – Ray a little close this time and a shortish handstand after – and then peels off on the bail. That means Auburn is counting those two 9.7s now on bars. Will make things difficult. 39.575 for Price in the AA. Reinstadtler – BB – Utah – aerial, hit – loso series, secur e- coming after a fall from Lee but Utah does have a little buffer. Still would prefer no more falls – switch to straddle 1/4 is good, just crooked – gainer full, stuck. An important hit. One of the judges went 10. Dear me. Skinner – BB – Utah – bhs loso, usual knees, usual secure – side aerial to sissone – switch to straddle to back tuck with a check – double tuck step back. So Utah will be fine. With BYU falling apart a little at the end of floor and Auburn counting some 9.7s on bars, Cal will have a few tenths to play with in that final rotation. Arkansas underway in final rotation. Yamzon with step forward on DLO 1/1 dismount. Shaffer – UB – Arkansas – toe on to toe shap, good – to bail, clean – good final hs – 1/2 turn to giant 1/2 to double tuck, stuck. Speed – UB – Arkansas – big tkatchev – giant full with legs to a stuck double tuck. That helps. Speed also 9.825 which means Arkansas is nearly clinched. Mattern basically would need a 10. She doesn’t get it. Clean until the dismount on the first Cal bars, short with a step forward. Williams – UB – Cal – a little close on hindorff but caught – leg break on bail, vertical – better final cast handstand – fings out DLO with a step forward. A little tight so far is Cal. Arkansas is officially through along with UCLA. Watterson was pretty on the pak on bars – giant full to double tuck, another bounce forward on double tuck. Schank – UB – Cal – finishes DLO, pikes it down a little at the end but their best landing of the bunch so far which should help the project. George – UB – Cal – tkatchev, hit – bail with some crazy legs but pulls it back – toe on to tuck full, holds the stick. Will get hit for the bail legs but should still get away with a countable score. BYU done with 196.300. Cal doing enough to maintain its margin over Auburn right now. Milliet – BB – Auburn – front tuck mount, awesome – nice full turn – bhs loso, hit, secure – cat leap to gainer full, stuck, Pretty. And a fall on a piked jaeger on the final bars routine for Cal. They’ll just have to hope this score holds up them. This makes things a little more interesting. Auburn can tie Cal with a 9.950 from Krippner. Aerial with a small lean – connects to beat nonetheless – and a check on the full turn, and another on the aerial, and that will do it. Cal dodged a bullet there. Krippner really nervous throughout this routine and wobbling on everything. Shame for Auburn. Got really close. It’s 9.025 for Krippner so Cal is our final team through! Please provide quad split screens for regionals coverage. It will be difficult enough to watch every regional at the exact same time, but it would be made easier with split screens. Where do you click? I have a button that minimizes and one that provides audio. I don’t see a quad view. I don’t see it either. Are you watching quad view on the App? I don’t seem to have that option. Only through the website, not the app. And you can have screens from several regionals at once! I’m not getting anything in the Stream. it still says broadcast starts soon… someone else? I think beam is the only one showing intros. The other feeds will go live once events start. God, the acoustics of the LSU meet are already driving me up the wall. All we can hear is that continuous scream in the background. It’s not produced by ESPN. They are just hosting. NC ST is doing it’s own broadcast. Streams aren´t working for me…any suggestions? I´m outside the US, but is that important? I can watch BTN2Go just fine from Germany, but not ESPN3. I´m from Germany too but it shows nothing at all for me 😦 no idea why, i tried on two different laptops. Yes, I was getting nauseous! i’m from Chile and i tried to switch the vpn but now my cable tv provider is not on the list to see espn play… why is so hard to be an gym fan outside the US?. anyone has an account to share? It’s pretty ridiculous in this case that the coverage is restricted to the US given that it’s not like there are networks in other countries providing competing coverage. Anyone know how to get a quad view from BTN? Along the control bar at the bottom of the cideo (where you can pause, makes full screen, etc.) There is an image of a box with four little boxes in it, click on that them search gymnastics and click of the other feeds to populate all four quadrants. It only works for me on my laptop through the website. I couldn’t get a quad view through the App on an iPad. I know Ruby has the 1.5, but I wish LSU would put Lexie back in on vault. Her full is beautiful and consistently scores so well. I suspect the only reason Lexie isn’t vaulting is due to injury concerns. It’s the same reason they only put her in floor on a few meets a year. When Lexie was competing on floor, it looked like she had a purple wrist brace on. LSU’s vault lineup doesn’t seem set yet. Harrold, Cannamela and Edwards haven’t really proven that any of the three deserve to be in over the other. I think the 4 who are clear for nationals are Finnegan, Priessman, Hambrick, and Edney. Technically Ruby has the highest scoring potential, but she’s so inconsistent it’s almost not worth risking her for the 10% chance she goes better than a 9.8. Edwards is better on consistency, but she still has her moments where she falls , and she’s yet to do the 1.5 with a solid landing. Cannamela is the most consistent of the three, but she’s the only one who I don’t see going higher than a 9.9. For me the best lineup is Finnegan, FTY Cannamela, Harrold, Priessman, Hambrick and Edney. I think that if Ruby goes below 9.8 like she usually does, then a pristine FTY from Cannamela can easily keep LSU’s vault score in the range where they’d want to be. And if Ruby conveniently manages to do the 1.5 the way she’s capable of, then she’ll maximize LSU’s vaulting total more than Edwards would. I have a feeling they’ll go with Edwards and Cannamela for the remaining two spots but I’d go with Ruby, though it’s still close in my mind. I would definitely keep Cannamela in the lineup. She has had two beautiful stuck vaults at SECs and now regionals. She’s earned her spot. Yeah that is true about her injuries. I always forget how many she’s had since she’s always so sharp, but remembered when I saw her with ice on her shoulder yesterday. I hope they are able to use her for nationals; her vault is a real score booster. Glad they’re keeping Cannamela in even with her full, because it’s gorgeous and also scores highly. If they’re resting Lexie’s vault for nationals, I suspect they’ll be looking at Edwards or Harrold for that last spot at nationals…despite her fall yesterday I feel like Edwards has been more consistent throughout the season of the 2. Edwards is more consistent than Ruby by far, I just feel that Ruby can get those 9.95 scores if she just hits the way she’s capable of while Edwards highest realistic post season scores will be a tenth lower, which could be the difference if they really want to upset Oklahoma. Individually, a 9.95 score would put Ruby in contention for the NCAA title, but the coaches in NCAA aren’t thinking about that, and Ruby would need to be perfect, which she hasn’t proven herself to be. Edwards is the safe option and Harrold is the going for broke option. It really depends on what they think is the best strategy at semifinals/super six. This vault camera. I just can’t. Is there anyway to watch the Tuscaloosa regional if you don’t have cable? Loving the speed of the NC St regional! It’ll get done on time, so we can move on to the next! The commentator at the Minneapolis Regionals cracks me up….. The jitteriness of the cameras are killing me. I could handle the partial routines if I didn’t get a headache watching the broadcast. Is anyone’s link to the Tuscaloosa scores working? (or does anyone have an alternative method of following scores?) I’ve been refreshing the page, but I’m not seeing any scores from Alabama. Thank you! I’ve got them now! I have very different opinions on the quality of Oklahoma’s routines. Webb in particular consistently scores at least a tenth higher than I think she’s going to. Fall on floor for UGA, so counting a 9.700 now. Nia Dennis has no business going on floor for UCLA when they could use Ross. Bad move. Why is it a bad move? It’s brilliant strategy to rest Ross. UCLA was never in any danger of not qualifying to Nationals. They are holding out so they can peak at NCAA. It’s going to be UCLA or Oklahoma for the title. LSU might be in it too. Val is making a smart move here, not a bad move as you state. If you include LSU in the same category as a potential champion then you have to include Nebraska based on how (surprisingly) close they finished to LSU today. And Florida, who actually out-scored LSU today, and has a ridiculously talented roster. They just need to have a solid day and they could be contenders. Agree. UCLA isn’t trying to peak for regionals. Also, Nia Dennis is from Columbus and how awesome to give her an opportunity to do floor in front of family and friends. Is it just me or does the vault feed for the Columbus regional not even show the vault (just the run)?! They don’t seem to be showing the vault for warmups but are for the actual competition. Nebraska may be one of the most underrated teams this year. What a great meet for the Huskers!! LSU and Nebraska the first two in. Morgan Lane UNC and Camille Drouin-Allaire GWU are the two AAers. Oregon State has no one qualify to Nationals. They were really bad on beam. That must be among the worst rotations ever for a seeded team. Lauren Bridges of Penn State and Cairo Leonard- Baker of ASU as individual AAers. No individual EF. What is the .1 neutral deduction listed next to ULCA’s score on the results page? Is that what they were talking about with Miss Val during vault? They went out of order, it was supposed to be Ross then Tratz, but they went the othe way around. Anyone know why UCLA got a .1 neutral deduction on vault? Never mind. It was for competing out of order. Weird, since isn’t that the order they usually compete? Who submitted the wrong lineup? Wow if Illinois as the 23rd ranked team turn out qualifying over Michigan and Georgia who look flat today. Would that be a record? 23rd ranked team making it to NCAA ? Kent St made it one year and they were ranked pretty low (maybe the 5th seed in the regional). Can we talk about that Meaghan Sievers from Iowa State will advance to Nationals as an individual because she freakin’ beat all of OU’s lineup on vault! Huge surprise! Also, Lexy Ramler will go for bars! Lexy Ramler? She got a 9.85 on bars… She was holding strong on the lead for beam until Maggie got a 10 though. Never mind I meant beam but then Maggie happened. Hope Ramler goes for AA then. What are you talking about? Lexy Ramler is 7th on UB. Stefani Catour is leading UB at the moment. Meh. Illinois deserved it more IMO. It’s clear from your comments, Rich, that you just don’t like Georgia. Next time say something positive about Illinois instead of just saying ick and gross to people who are genuinely happy for Georgia. It was a close meet and every team fought hard. BOTH teams only finished 2-3 because Michigan choked. Georgia is going to NCAA’s! YASSSSSSSS. These comment sections used to be so positive. Georgia is going to Nationals! Wow! Never would have though that after the first rotation. They actually beat Michigan by .1 on floor and were just .1 behind Illinois on floor. It was a bad rotation definitely, but it didn’t have the impact so many thought it would. Wow. Nationals is going to have LSU, Florida, Bama, Kentucky, Arkansas, and Georgia. Half the teams will be SEC!! Arkansas is not through yet. Even though some people like to complain about SEC scoring, they are definitely the best conference in ncaa gym! LSU, Bama, UGA, and Arkansas are all going to be in the same session at semi-finals. Along with Nebraska and UCLA. I vote for LSU, Bama and UCLA making it to Super Six. Though Nebraska could pull off an upset if one of them have a bad day. OU, Kentucky, Florida, Washington, Utah, Cal. This one looks pretty straight forward for: OU, UF and Utah. It would be a major upset if one of them didn’t go through – SF 2 is definitely the stronger one with more Super Six capable teams – well Nebraska/Bama/LSU/UCLA battling for three sports. Based on everything we’ve seen during the season UGA, Arkansas, Kentucky, Washington and Cal are all pretty similar. Gahhhh seeing the Georgia team cry made me cry! No gymnast deserves that triumph more than Vega too. Agreed! And watching LoJo hug Oakley after her vault made me smile so much. Johnson is an amazing teammate and cheerleader. Yeah, that got me too. So great to see Vega nail that routine when they really needed it. So impressed! Danelle Pedrick CMU tied with Sabrina Vega on FX 9.900. Since Vega already qualified with UGA does that mean Pedrick goes for FX? Also, Brianna Brown goes AA for Michigan, but Lexi Funk of Michigan and and Rae Balthazor of Illinois are tied for the 2nd AAer advancing- tie breaker or both go? I believe all ties go through. ta tiebreaker was used. Balthazor is in and Funk is out. I’m new to following NCAA, but how does Rae make it in? She’s 6th in the final,standings and there’s several Michigan athletes ahead of her. If you’re looking at the individual all-around section of the score page, the gymnasts are not listed in order of their scores. So even though Rae Balthazor is the sixth gymnast listed in that section, she didn’t finish sixth in the all-around. If you look at their scores, Lexi Graber of Alabama had the highest all-around score, but she’s already going to Nationals with her team. Sydney Snead of Georgia is second and is also going with her team. In third is Brianna Brown from Michigan who is the first individual all-around qualifier from the Tuscaloosa regional. Next are Rae Balthazor from Illinois and Lexi Funk from Michigan tied for fourth. Per the tie-breaker, Rae Balthazor gets the second AA spot. That Alabama standings site is the worst (well, except for whatever the one is at the Elevate the Stage meets that didn’t even work) and confused me similarly yesterday. I can’t figure out what order the AA standings are in. They aren’t in order of scores, teams, or alphabetical. Just random. Super helpful. Did anyone see Kocian’s bar routine? How did she look and what were the skills? She did a a fairly simple routine. Maloney + Pak, sole circle back to high bar and then full-twisting double tuck dismount. She looked clean with some great height on the dismount. Thank you! Love her. So excited to see her back and can’t wait to see what she does next year. I ADORE Peng, but the only rational judge had their score dropped (the 9.775). Leg up check, followed by hip break check, large bounce back on dismount…… and like those are just what joe off the street could see! Yep, some big names getting very generous scoring on beam today. Similar thing happened to Skinner on beam who never should have scored a 9.9 with a check on her back tuck and step on the dismount. While they easily would have qualified anyway, Utah’s team-total definitely benefited from the home-scoring today. All the strict judges were sent to Alabama – the scores there were very tight and strict. I don’t think anyone received a gift and no one can complain (though I bet some will try) because they gave the judges reason to find deductions. I agree about the Bama judges. Judging was tight, but fair and applied equally to all teams. Scoring is high at Utah, especially on floor! I’m more than thrilled to have her back in the bars lineup (they really needed it) but I miss her gorgeous stalder work. Hoping she’ll bring it back next year once she’s back at full strength! I’m happy for Georgia. However, as a Michigan fan, I wanted them ideally. Then Illinois, because Big 10. But after the season they had, I’m happy they made it. THANK YOU Spencer for all your prep work and live blog for regionals! Kudos to Cal for advancing and for great sportsmanship — they were cheering for Ebee on floor (they were done with vault). I was really impressed by Ohio State today. I hope they carry the momentum from a great regionals into next year. I’d love to see the Big Ten become more than Michigan and Nebraska! I agree…Ohio State looked the best they’ve looked in years, and they were actually competitive for that second spot….which they haven’t been for a while. Amazing what getting rid of a coach that can’t stand the team can do for morale…good riddance to the Fagan reign of mediocrity and looking forward to even better times with Paulicivic. Ohio State just tweeted that this is their best finish since 2012! Thank you Meredith ! You could definitely see the Utah influence even in the award presentations….totally different from years past! I completely agree! 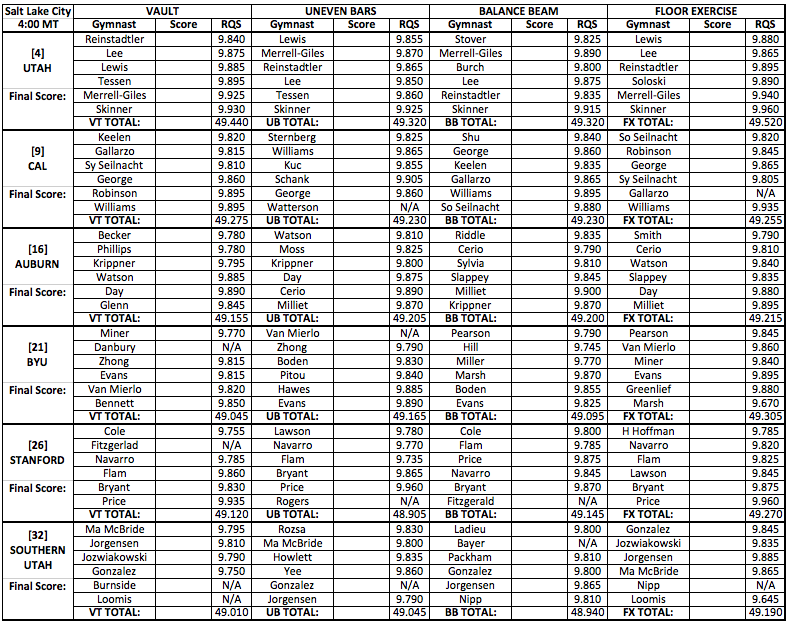 I was in Columbus and Ohio State was a tentative beam rotation/off day from Mattern away from qualifying. Ohio State’s floor was the most impressive rotation from any team there aside from UCLA (less than a tenth behind UCLA on floor). Meredith’s choreography is excellent. Also, at the awards it looked like Jamie Stone might not have realized she qualified as an individual- her reaction was so sweet when they announced it. i just saw on the utah feed that Ebee got a gymnast of the year award – is this a regional award? i remember Peng got one last year after regionals. Do we have seedings/ Afternoon. Night sessions? NCAA is going to be the closest ever to make it into the Final Super Six. The 1st Semifinal is going to be a battle for that third spot as long as Nebraska has a hit meet. Alabama would have to pour their all into semifinals again to get past a hitting Nebraska. Even a nailed meet might not be enough for Alabama. The 2nd Semifinal has a clearer separation between top 3 and the bottom 3. Utah and Florida would have to count a fall-type score to be beat by Kentucky, Cal, or Washington. And Oklahoma would probably finish top 3 even counting one fall. That’s advantage LSU or UCLA in Super Six since OU will be competing in the late SF and have the short turnaround – reverse of what happened between OU and LSU last year. In 2017 it was Nebraska that Alabama ousted when Nicki hit her final beam routine to clinch Super Six. Reversal in 2018? 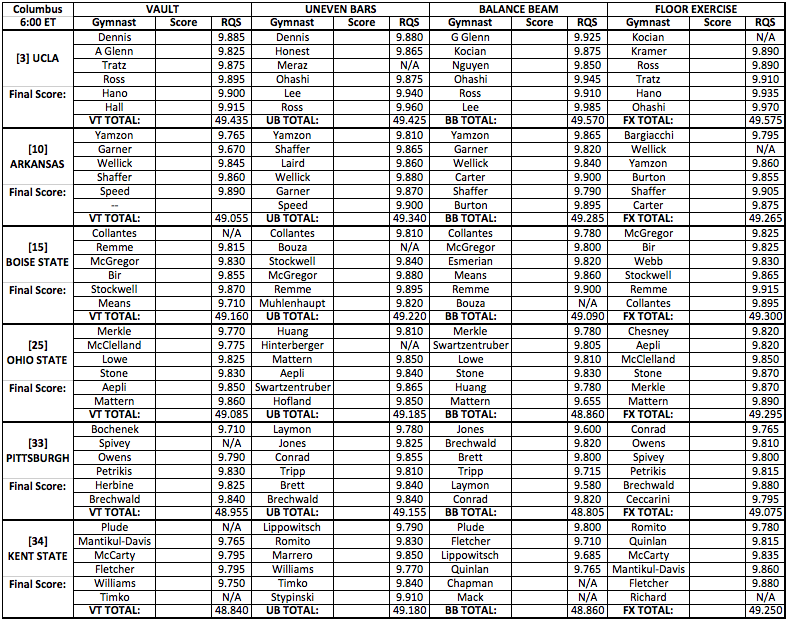 Though both Nebraska and Alabama are vulnerable to mistakes which could open the door for UGA/Arkansas… but then again Bama has gone nine weeks without going lower than 196.975 and at Regionals all they had to do was stay on the beam (after hitting bars so well). Nationals can be crazy though. Remember the LSU beam implosion? Teams you think are locks can stumble under the pressure. @Gabija The advantage is not so much about sleeping time or anything like that. Rather, it’s about how much rest the athletes’ bodies get between competitions. The afternoon session competes 6 hours before the evening session, so the people in the afternoon session get an extra 6 hours for their bodies to recover between competitions. The six hours isn’t that big of a deal. The AAers may feel it a bit, but if a gymnast is just competing one or two events, they should be absolutely fine. The competition used to be three days with event finals and people were able to compete gorgeous routines even on the third day. If anything, it’s a mental test.